Jacey Bedford lives behind a desk in Pennine Yorkshire. She's been a librarian, a postmistress and (for 20 years) a singer with internationally touring a cappella trio, Artisan. She's had short stories published on both sides of the Atlantic in anthologies and magazines before getting a book deal with DAW in the USA for three novels. 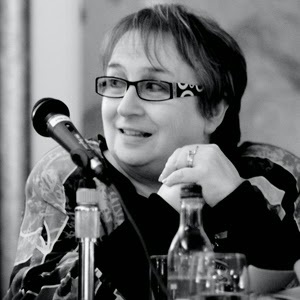 She's one of the organisers of the annual Milford SF Writers' Conference and the Northwrite SF writers group. She's a fairly recent convert to conventions, though this year has been busy with Eastercon, Worldcon in London and Fantasycon in York. She'll be at Bristolcon for the first time in October and returning to Novacon in Nottingham in November. I write both science fiction and fantasy and have a three book deal with DAW in the USA. My first book, Empire of Dust is a star-spanning space opera about trust and betrayal. It's published in November 2014 and will be followed by Crossways in 2015. I'm currently in the process of writing Crossways, the sequel to Empire of Dust. As is often the way of things in publishing, books aren't always released in the order you write them. Empire of Dust has been written and rewritten a number of times. Empire (and Crossways) feature psi-techs, humans implanted with telepath technology. They are creations of the megacorporations and their enhanced skills in navigation, engineering and communication are at the heart of the megacorps success, but the psi-techs pay a high price. They are indentured to the megacorps, looked after only as long as they toe the line. I've written about what happens when some of them face a moral choice that puts them on the wrong side of the megacorps and the law. Cara Carlinni is on the run after uncovering corruption. Alphacorp can find their implant-augmented telepaths, anywhere, anytime, mind-to-mind, so even though it's driving her half-crazy she's powered down and has been surviving on tranqs and willpower. So far, so good. It’s been almost a year, and her mind is still her own even though she’s stuck on a backwater space station. At least she’s got a breathing space, or has she? When an Alphacorp ship docks, looking for her, Cara hitches a ride out with Ben Benjamin, a psi-tech Navigator. He may be a bit of a stuffed shirt, but at least he’s not actively trying to kill her, and since The Trust is Alphacorp’s biggest rival, she’ll take a chance. Ben's not as straight-laced as he looks. He’s got a stubborn streak and he’s not afraid to bend rules and put the spirit of the law above the letter. Right now his career is teetering after losing a colony, and most of his team, to a fleet of raiders. He suspects boardroom betrayal, but has no proof. Cara and Ben are about to find themselves caught in a star-spanning manhunt, and if their enemies track them down, an entire colony planet could pay the ultimate price. To trust my instincts. I cut one of my earlier versions severely to please my (then) agent. Luckily I kept the old version because my current editor asked me to expand on this and deepen that - and most of what she asked for had been in that earlier pre-cut version. I'm half pantser and half plotter, that is I start out writing by the seat of my pants, writing to discover more about the characters and what's happening to them. I generally have an idea of what the end will be - but at that point it's very vague. Four or five chapters in, with maybe twenty or thirty thousand words written, I sit down and try and take control of the plot before it gets out of hand. It sometimes means I end up rewriting the beginning, sometimes not. I don't plot in great detail, however, otherwise when I'm writing it I get a sense that I've already done it once. New ideas will always come into play and then I have to build them in or alter things as I go along. I'm a burst writer. I have done as many as ten thousand words in a day, but I can't keep up that pace for long. Like many other writers I fit my writing in around the demands of a day job, but luckily I'm self-employed (a music booking agent for folk musicians) so I can schedule my day to suit myself. I'm also an owl. I often work late into the night, but I'm pretty useless in the mornings. Not really, no. I'd written three full novels before I wrote and sold my first short story. Novel writing and short story writing are very different. Both need discipline, but if anything, short stories need greater discipline to bring in a complete story with a beginning, middle and end in just a few thousand words. I always want to introduce too many characters and layer in a few sub-plots and you can't do that in a short story. I've probably only written about thirty or forty short stories and sold about fifteen of them. I prefer long form, but if I'm writing short stories I actually like flash. I didn't used to be able to write a short story in under 7500 words, but I'm getting better at being more concise. I sold a 950 word short story to Nature Magazine a couple of years ago, The Loneliness of the Long Distance Panda, and it's resold and been reprinted a few times. It's in the Futures 2 anthology, coming out at Buzzymag.com next year and has been translated into Galician for the Spanish magazine, Nova Fantasia, where it's A Soidade do Panda de Longa Distáncia. How cool is that? I don't know that I identify with any of the main characters from my books. They are very different from me, but each has traits that I can understand: Ben's sense of justice and his determination to do the best he can for the people who are relying on him; Cara's deep desire to find a safe place; Crowder's dedication to the Trust, Lorient's imperative not to compromise his own principles. I suppose the character who's most like me is Wenna, a supporting character who likes to organize things. You wouldn't know it from my desk, but I am an organizer even if, like Wenna, I don't have a prosthetic arm and do my job in space. I'm proud of being published in general. It's been a long-term ambition and at last I've achieved it. I'm not sure I could pick out one bit above the rest, though I did very much enjoy writing the twisty plot-related relationship between Ben, Cara and Ari van Blaiden, one of the book's bad guys whose presence drives a lot of the plot even though he's hardly on the page until the end. I had two agents who came and went before I got my deal by sending another novel, Winterwood, to DAW's slush pile myself. DAW's slush pile is huge and the editors' time is very limited, so I was lucky to have a personal introduction from the very talented Kari Sperring whose two books, Living With Ghosts and The Grass King's Concubine, are both published by DAW. Sheila Gilbert, my editor, made me an offer for Winterwood and then asked what else I had. 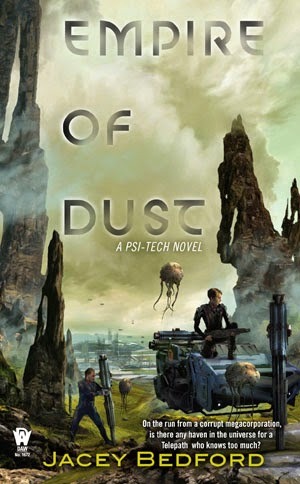 After reading Empire of Dust she decided that we'd start with that one as she had an opening in her publication schedule for science fiction in November 2014. If we'd gone with Winterwood first it would likely not have come out until spring 2015. At the time I got the publisher's offer I was between agents, but I'd started sending out queries to get a new agent. I'd had some responses and been asked for full manuscripts by some agents but it was still early days. When I got my offer from DAW I emailed my top ten agent picks and asked that if they were interested they got back to me straight away because I would need them to deal with the offer that was already on the table. Unsurprisingly I got a lot of interest and, after long phone conversations, six offers of representation. They were all good, sound offers, but two were particularly attractive. In the end I went with Amy Boggs of the Donald Maass Literary Agency in New York. Amy is a young agent, enthusiastic, personable, and she has the might and experience of DMLA behind her, an agency which originated as a specialist agency for science fiction and fantasy. I can honestly say that without the lessons learned and the contacts made at Milford SF Writers' Conference I wouldn't be published now, so seek effective critique from fellow writers and learn from it. Many thanks to Jacey for her interesting answers!